This morning I went out with PD7YY and PG8M to test our low band antenna set-up in preparation for the PACC contest in February. It took us a lot of time to get the set-up right mainly because we were too ambitious in our attempt to support 3 different dipoles (inverted v style) from one center pole. If you have 6 wires running from a rocking fiberglass pole with a couple of guy wires to add to the complexity, you will end up with a nice spaghetti. So we will change our plan and support only 2 antennas from the center pole. Ynomy (pronounced something like Why Not Me?) is a new radio club consisting of PD7YY, PG8M and myself. For some 4 years now we regularly meet each other in the Region 6 (Arnhem) monthly club evening. We share a passion for ham radio (duh!) but also for /P activities from interesting locations, for DX chasing and for contesting.. well, at least participating in the PACC contest. In 2013 the idea to participate in PACC with our region's club call (PI4ANH) was born. PD7YY and PG8M participated using the club station with very minimal means. 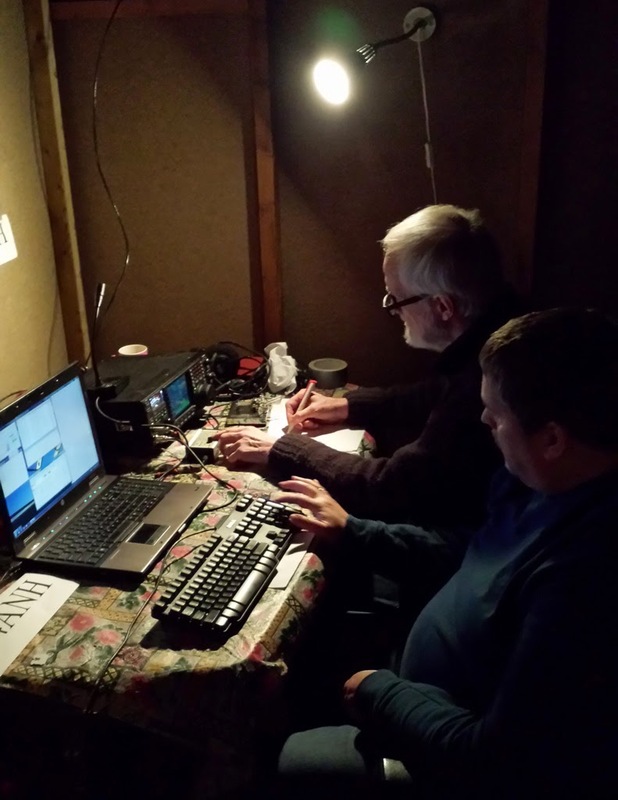 I had social obligations and entered the contest only for a few hours on Saturday evening / night on 80m. 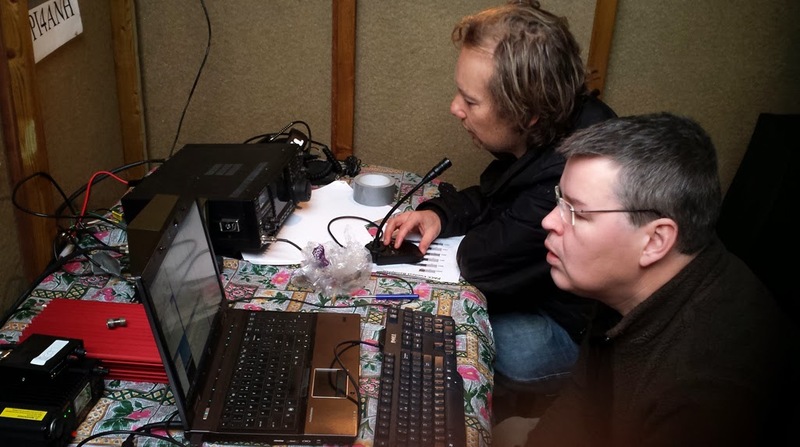 This year we did a proper attempt to set a good score during the PACC contest with a full blown temporary contest station. We used the PI4ANH club call again this time. Next year we will be back during PACC determined to improve on our score of this year. We have decided we need a better contest call and for that reason we have requested a temporary special call: PE55E. It is one that is easy to pronounce and it is a short call on CW (note that a special call in PA needs to have at least two numbers and can only be claimed for one month). As we see ourselves organising more joint activities we decided we needed a name - a carrier for all the temporary calls we will be using. This of course has to be Ynomy. Ynomy has a website of its own (still under construction at this moment) where I hope a lot of interesting experiences will accumulate - like our future DXpeditions to P5 and numerous highly wanted and at the same time very comfortable islands (sun, beach, cocktails and radio fun). 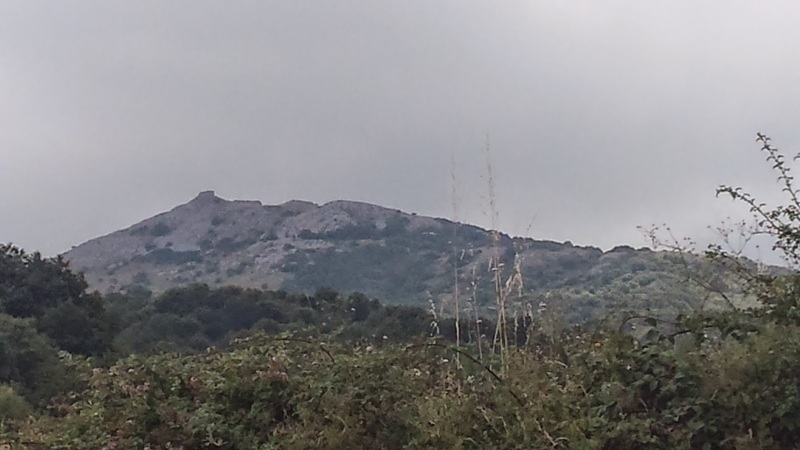 I am just back from a holiday well spent in southern Tuscany (the area is known as Maremma). The reason to mention my holiday here is that I took my radio with me and got to operate it as well. I decided to keep my radio stuffed away on the camping and only operate it on two planned off-camping /P activities. This way I minimised the impact of my peculiar hobby on the time I had with my family. I have to add that I do not enjoy digital operation as much as voice (and when in a tent on a very quiet camping I am not comfortable working voice). This tips the scale even more in favour of limiting the radio-activity to off-camping /P trips. The place I stayed was surrounded by no less than four IFF recognised nature reserves - all within 40 minutes drive. I was thinking of activating three but in the flow of my holiday ended up with two time slots large enough to go out /P. 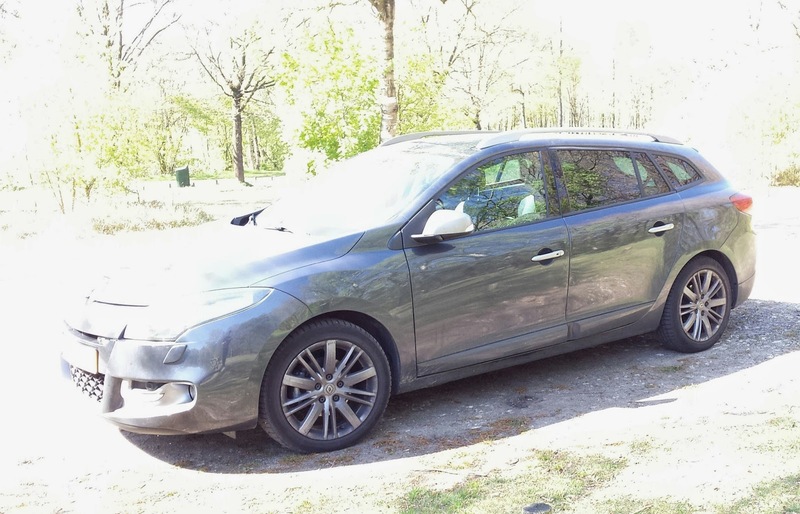 The first activity was from nature reserve Monte Labbro (IFF-660). 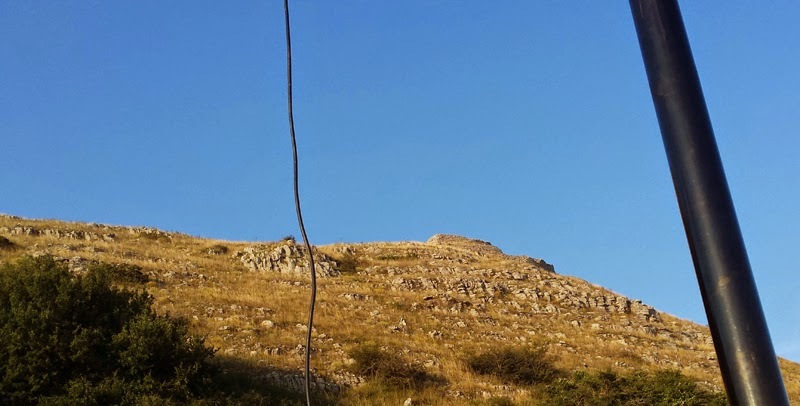 The mountain itself is know for its ruins of a tower built by Davide Lazzaretti, leader of the Giusdavidic Church. Preparing my visit I had checked Google Maps and expected to be able to get to the top of the mountain. When I arrived there however (via a very rough cobble road) it turned out the last part of the route was a footpath. Without proper support I was not able to set up my station on the top and decided to stay with my car, just below the top of the mountain. This might have influenced my rx and tx as the mountain blocked approx 90 degrees (north to east). Weather was okay with cloudy skies at the start of my activity around 16h local time and the sun appearing later in the afternoon. Radio conditions were far from okay however. IFF requires that you log 100 chasers to make an activity valid. In my experience this is very do-able as there is a large chaser community out there. This time however I struggled and only logged my 100th contact after almost 4h, changing bands (and antennas) six times in the mean time looking for an opening. I stayed for another 1,5 hours logging 58 contacts when 40m picked up. I even got to work some stations on 6m, amongst them my fellow club member PG8M - which I found the most remarkable event as 6m is not known for its reliability (understatement). I logged two other fellow club members on holiday: PD7YY in OZ and PE1WBU in LA. I worked on 6 different bands using end feds and my c-pole for 40m on my 17m mast. 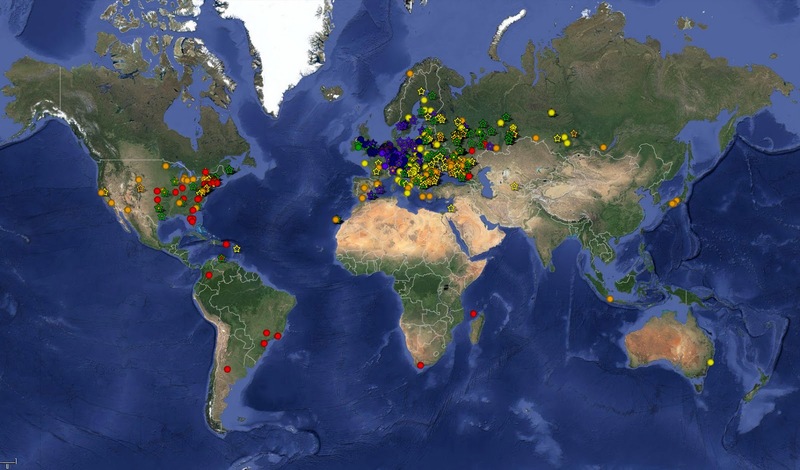 I logged 158 contacts (146 different stations) from 35 DXCC. DX included W1, A7, EA9, R9 and PT7. My second activity was one week later from IFF-702 - a relatively new reference. When I was checking it out before my holiday it had actually not been activated according to the WWFF database. By the time I got there a log had been uploaded - so it had been activated once. Conditions were still far from good (being in between trees might have played a part) but this time I logged 199 contacts. This was in a 6h period, so a low number in my experience. I have to add that I lost 90 minutes setting up and later breaking down my inverted V for 40m and 80m. I decided to use them after my somewhat disappointing results at IFF-660. Setting these two inverted V's up in between the trees turned out to be a challenge. I did log 68 contacts on these two bands (exceptional if you consider that QRM was S9 on 40m and S9+ on 80m) - so it was worth the effort. I worked on 5 different bands using end feds and my inverted V's for 40m and 80m on my 17m mast. 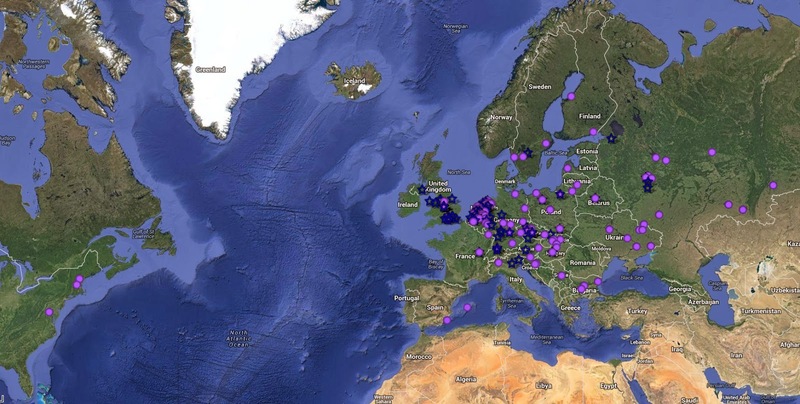 I logged 199 contacts (182 different stations) from 38 DXCC. DX included W1, VE1, 4Z and PY1. 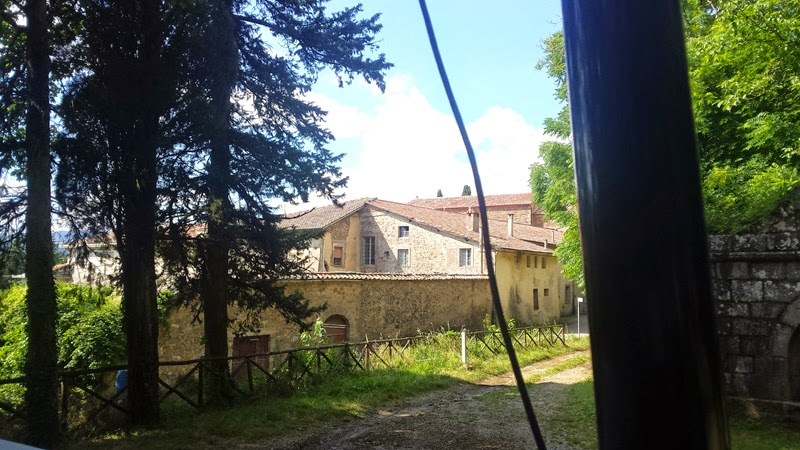 Thanks to Max IK1GPG and Steve IZ5GST for their information about IFF / activating in Italy. During my holidays in Italy the results of the PACC contest arrived. I was active using the regional club call PI4ANH (Arnhem region) together with PD7YY and PG8M. I previously blogged about our experiences during this contest. On our first contest we managed to finish 6th in the multi operator single tx category. I think this is a brilliant result. Relatively we scored a lot of multipliers and we managed to log quite OK, with just over 2% of our logged QSOs resulting in penalties (18 out of 776). With the lessons learned from this first experience we will be aiming for a 4th place next year. Last Friday afternoon I went to PAFF-056 as planned. Weather turned out okay so I brought a couple of antennas, including my hexbeam. The plan was to activate the park and catch some DX in the process. Setting up took more time than usual. This was caused by a bit of damage control I still had to do after the mast crashed down during the PACC contest. Of course there was a new mast support to install and I brought my C-Pole for 40m for the first time. I arrived in the reserve at 15h local time but logged the first contact only at 16h - J8 on 20m for a new band DXCC. After listening around for other DX I only encountered VU4 but the zoo was enormous - not something I was going to waste my time on. Just before 16:30 I started calling CQ on 20m using my mono band End Fed (vertically on a fibreglass pole) and my Hexbeam pointing towards NA. After about one hour things started to quiet down and I scanned the bands for new DX to catch. I found 3B8 on 10m and added that one to the log to reach 200 DXCCs. One of the targets for this year but clearly not very a very ambitious one. Then it was time to go down to 40m. This was a time consuming switch as the new C-Pole antenna I brought turned out to be a bit too short. I tried it above my roof at home one night after constructing it and there it was okay, but having it in the field and on a different height clearly has a lot of effect on the resonance frequency. I do not take any tuning devices with me when I go /P as I am careful to always take resonant antennas (I do not like the idea of wasting valuable radiation energy when /P) so I had to fix this - it was resonant around 7.4Mhz, "slightly" off. Fortunately I brought extra wire and randomly added some lengths to both legs of the folded dipole. With some luck I got it to resonate in the relevant portion of the band. With a resonant antenna I was ready for some serious WWFF activity again - 40m is always a popular band for WWFF chasers in EU. However it turned out the band was a terrible mess. It was crowded and QRM was S8-9 all over the band with a spiking signal (electric fence?) every second of 9+10. Great! I logged 5 contacts before giving up and returning to a higher band - 15m this time using only the hexbeam. 15m was not particularly busy and was slowly closing while it was getting dark outside. I was planning to go back to 40m hoping the QRM would die out a bit. Before that however I packed up the hexbeam and all other stuff I was not going to use and definitely would have a hard time finding in the dark. Around 20:20 local time I was back on 40m but to my disappointment it was still one big sea of QRM all over the place. However there were quite a number of strong signals (above QRM level) around so I gave it a try anyway and logged 56 contacts in the following 40 minutes. Half way during this session on 40m a very peculiar thing happened. I got a call from a station that I heard to be something like ?K7AC. Now you have to imagine that it was a terrible QRM mess and that I had been logging EU contacts only. So I initially thought it was IK7AC - although the OM was definitely not Italian. When he repeated his call a couple of times I could only conclude that it was VK7AC - peaking S9 with me. He gave me 57. Before this contact my ODX on 40m was TG - just a bit over half the distance - that I worked using my full size inverted V (my favourite DX antenna on 40m until this day) and more power - 300 in stead of the 90W I was using now. A nice surprise that completely wiped out my frustration about the band condition. At 21h I called it a day - completely exhausted from pulling stations through the constant noise. I packed up the last bits and went back home. All in all I logged 175 contacts from 40 DXCCs, including a lot of familiar call signs and some fellow FF national coordinators. Noteworthy DX included - VK7 (duh! ), 3B8, 5R8, J8, ZS6 (on the side of the hexbeam) and a couple of stations in central USA. Not as much as I hoped to catch with the extra hassle of installing the hexbeam but enough highlights to travel home satisfied. Quite unexpectedly I am faced with a nice gap in my schedule this Friday afternoon that allows me to play radio again for a few hours. The gap is large enough to go out and combine a bit of DX fishing with the activation of a nature reserve in the area. Checking the activation list of PAFF I found that Haaksbergseveen (PAFF-056) is in need of activation as it has only been reached by just about 100 chasers. I have been there before - so it is not a new one for me as FF activator. The last time I was there I was only able to find an operating spot in between a lot of trees. Using Google Maps I have now spotted an open area that seems to be reachable. 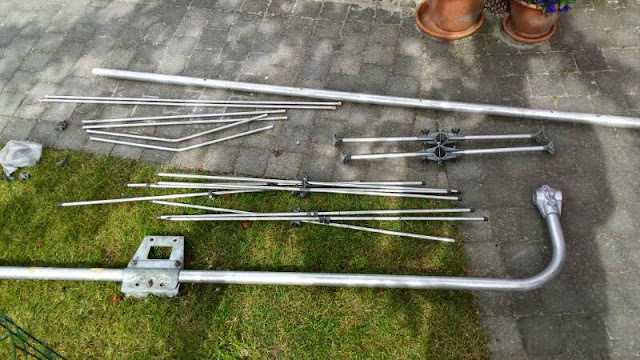 I just managed to build a new mast support in time after losing the previous one in the storm during PACC (wood again, as I did not find the time to sit down and design a alu drive-on version yet), so I am thinking of taking my aluminium mast and folding hexbeam. It may give DX FF chasers a better chance to reach me and it should help me to maybe find some new DX. During PACC we used N1MM to log our contacts. Afterwards I imported the data into my HRD Logbook and added the QRZ data to get a better idea of our results. We logged 52 DXCCs and 12 US states. 10, 15 and 20m contacts are as expected scattered around the planet with 10m getting us in to South America (an easy route on 10m from our location) & South Africa (and Mayotte.. of all places); 15m into Japan and 20m into Australia. All quite familiar results from my earlier activities with the hexbeam. On 40m we got well into the US and Caribbean (PJ & WP). 80m got us into the US - East Coast and Asiatic Russia. On 160m we did not get outside of Europe but we reached the Moscow region both in phone and CW, which is quite a bit further than we expected to get. As blogged before February featured my first contest as a serious contender: the PACC contest that runs from Saturday 12 UTC to Sunday 12 UTC. 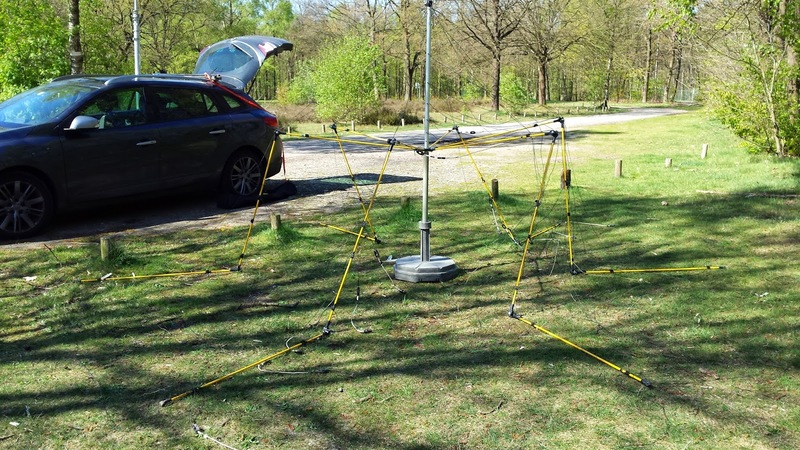 A small team from the Arnhem region (PG8M, PD7YY and myself) set out to activate our club call PI4ANH and try to achieve an acceptable score. We used a single radio multi op set up. 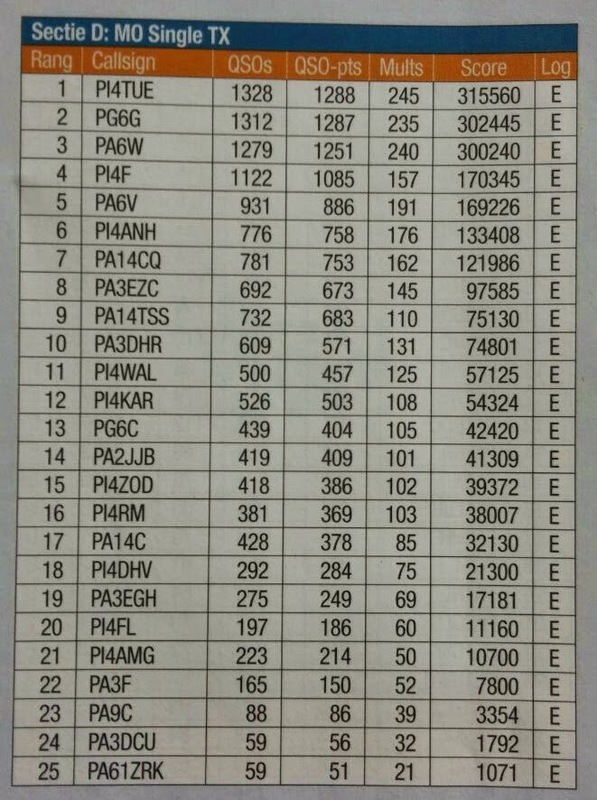 PG8M did some CW while PD7YY and myself handled the phone contacts. 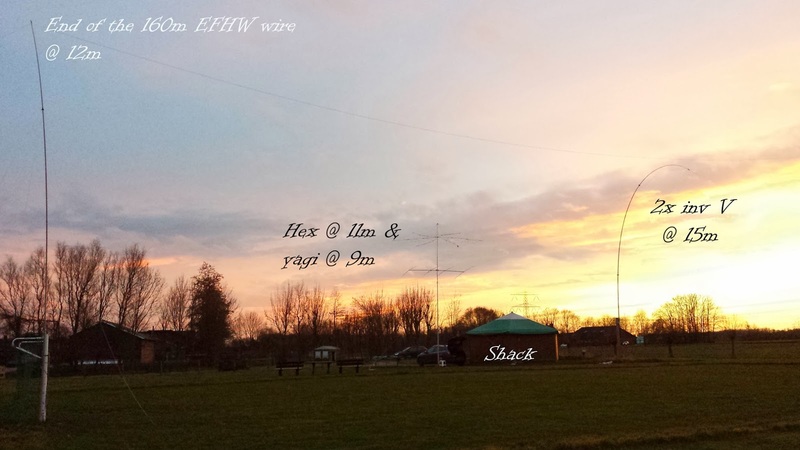 Two club members that are avid CW OPs (PA3GWC & PA3DCX) came by late on Saturday to boost our CW performance for a couple of hours. The weekend featured typical autumn weather (even though it is winter in February on this part of the planet): rain and strong winds. The heating of the cabin we were in was limited so we were happy it was not freezing but the grounds were soaked after days of rain, causing everything to end up covered in mud (clothing, wires, masts, etc.). The wind posed a challenge both while setting up the antennas as well as in keeping them up (more on that later) and it made for a lot of alarming noises shaking the cabin we were in. On Saturday morning we arrived on the camp site and started to set up the station consisting of my IC-756ProIII, various microphones, a mobile amp and 5 different antennas: hexbeam (10-20m), yagi (10m), inverted V for 40m, inverted V for 80m and an end fed half wave wire antenna for 160m. Setting up the two HF beams was familiar territory - as I have used them more than once in /P operations. The inverted V for 40 and for 80m was a bit more work than expected. I acquired a new 17m long pole from Spiderbeam that I had not used before. Putting that up, with all the guy lines and two inverted V's in very windy conditions took quite some time. 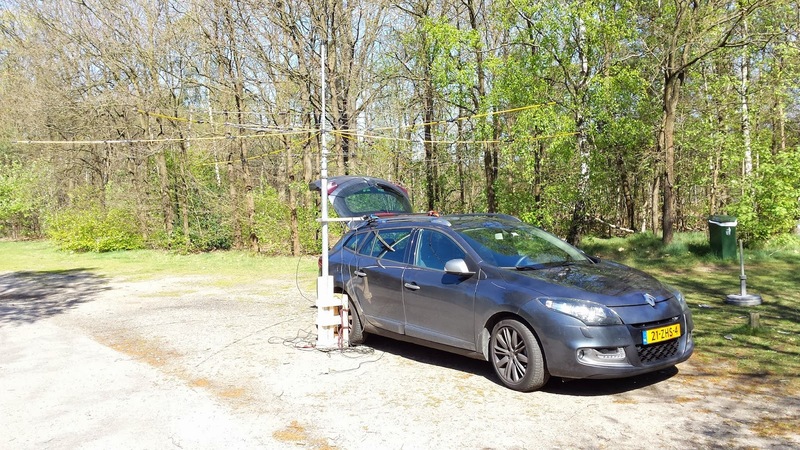 PG8M was in the mean time busy tuning the 160m antenna - a new end fed wire antenna he prepared specifically for this contest. We set that last antenna up using two 12m poles attached to the goal posts on the sports field next to our shack. The 160m was very low (around 10m high in the centre) relative to the wave length. The wire was however running across a very very wet field. 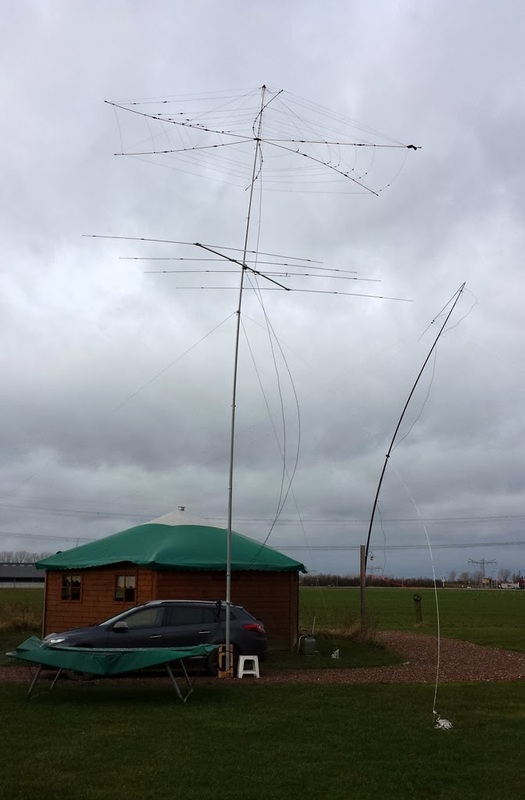 Maybe that helped us a bit..
We had the hex and yagi up well before the contest began. PD7YY reminded us of the DX-pedition on Amsterdam Isl. and we could indeed copy them on 10m. Both PG8M and myself lack a good antenna at home so we used the opportunity with the 4 element to get into the log of FT5ZM. A nice start of the day. 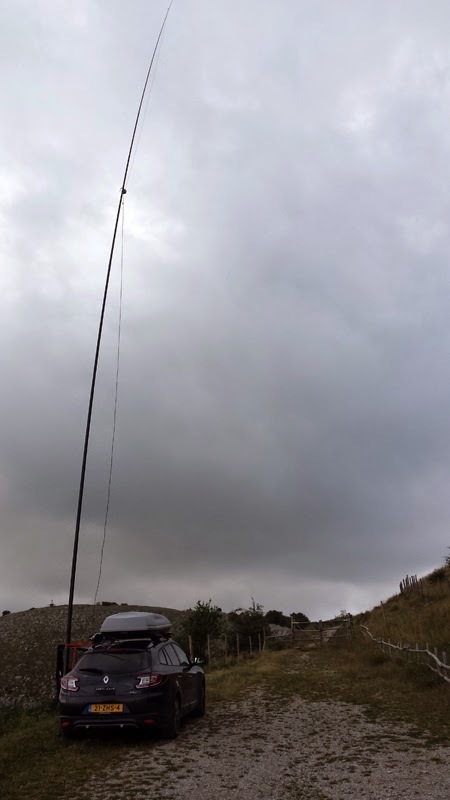 At noon UTC PD7YY started things off behind the microphone while PG8M and myself completed the low band antennas during the first part of the afternoon. We took shifts sleeping, making sure we were on the air 24h. Apart from the fact that you still end up exhausted, this worked as planned. We had a second cabin for sleeping, a short walking distance from our temporary shack. Conditions on the higher bands were not very good. They had been excellent in the days preceding the contest but with Aurora that very morning 10m was almost killed and DX was sparse all together. 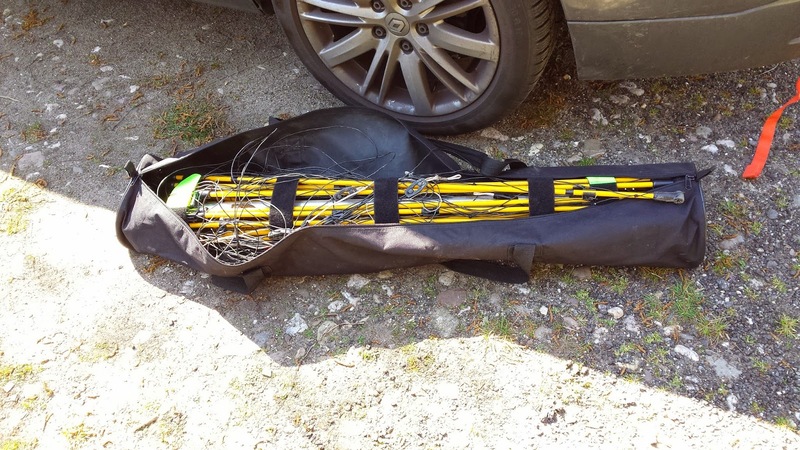 We did use all the bands but logged only around 60 contacts on 10m - for which we brought a separate mono band yagi. My impression was that there was a considerable group of OMs active in the contest - allowing for a nice steady flow of contacts now and again and even some pile-ups. The wind kept on pounding our set-up but we were fine until 20 minutes before the end of the contest on Sunday early afternoon. PD7YY was on the radio and we copied EK for a new multiplier on 20m. His signal was quite al-right but he did not seem to hear us. My gut feeling told me something was wrong and indeed it was. When I came out of the cabin I saw the main mast had collapsed taking down the hex and the yagi. The hex had luckily folded upwards without sustaining any structural impact as far as I have been able to assess slightly helped by the yagi breaking the impact. This does mean that the yagi lost 4 elements (one side of the yagi) as they are all bent beyond repair. Nothing else had been hit and the elements are replaceable - so nothing too dramatic. It is definitely time for a better support - I am thinking about a drive-on support like the one developed by M0UOO (but that is something for a future post). Funny thing is that we could copy EK well with just a bunch of wires on the ground (the collapsed hex)... incredible. After looking at the mess PD7YY completed the last minutes on 40m (no time to waste.. we were in a contest, remember) and PG8M and myself started to clean up the muddy mess. We managed to log 803 contacts, 5 of which were dupes and 3 were contacts with PJ4NX who was using "CN" as exchange - an exchange not officially accepted it seems. This leaves 795 points. We scored 178 multipliers bringing us to a total of 141.510 points. We scored most of our points on 20m (204 x 40), followed by 40m (164 x 36), 15m (142 x 34) and 80m (136 x 28). The "edges" 160m and 10m are close - with 160m (87 x 17) beating 10m (62 x 23).. that is completely against what we expected (we expected far more points on 10m and far less on 160m). We have learned that setting up all antennas takes more time than expected. This was partly due to the new components used (new pole, new wire antenna) and the weather. We have learned some operating efficiencies regarding the switching between modes and operators. We think we now know a bit better what band and mode to use at what moment in the contest. 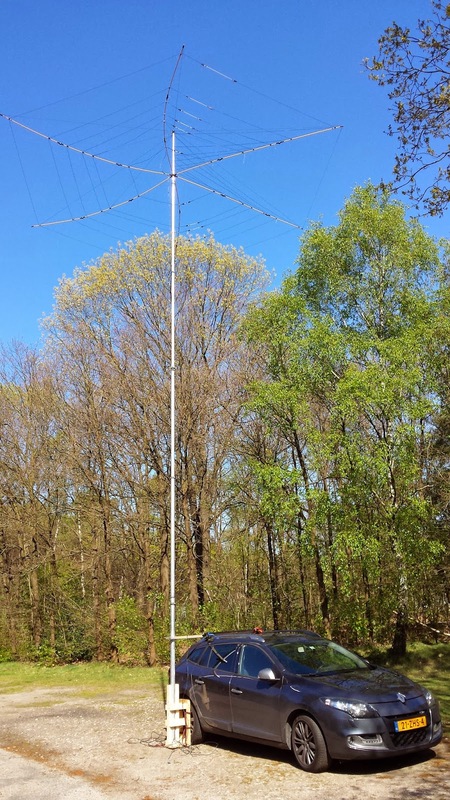 We have learned that for working local / regional stations it is useful to have a vertical in place at least for 20m - in addition to the hex. The yagi did not bring a lot of benefit, so we will skip it next time. Investing in a 160m antenna does pay out. I expect we will be back next year to see if we can beat the 2014 score. This weekend I will have my first serious contest. I have entered contests before but mainly for either of these two reasons: (1) absolute boredom - contacting stations randomly or (2) serious DX-ing - trying to get new DXCCs in the log, like with CQWW 2012 and CQWW 2013. Last year the idea to enter the PACC contest with the our local ham club call was coined. A few club members met in our club house for an afternoon & evening activity. Unfortunately I was not able to join as I had other commitments. 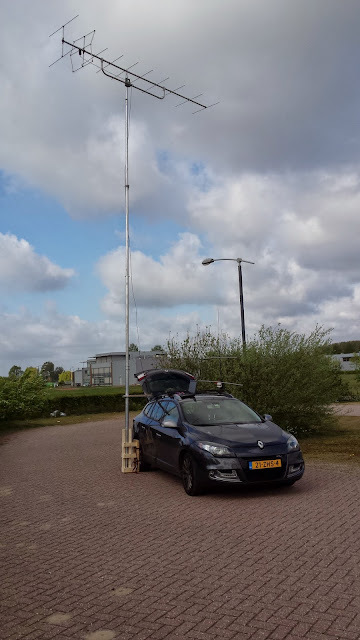 On my way home that Saturday I could not resist setting up my newly constructed 80 inverted V on a deserted parking area and entered the contest anyway on my own call sign. This year I have been able to block the PACC weekend. Together with PD7YY and PG8M - who mainly operated our club call PI4ANH during the contest last year - we drew a plan to make a more serious effort this year. The contest runs for 24h from Saturday 12pm UTC to Sunday 12pm UTC and we aim to be active during the whole contest with the three of us and some other club members visiting on Saturday. We decided to use our club call PI4ANH again but were quite keen on finding a more suitable operating location. Our club house has a long wire running over the roof. 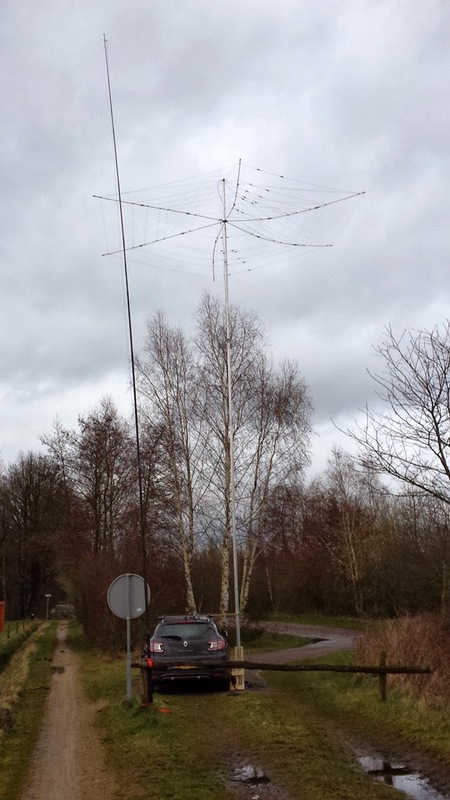 This is not a very effective antenna that on top of that features matching problems on 80m. 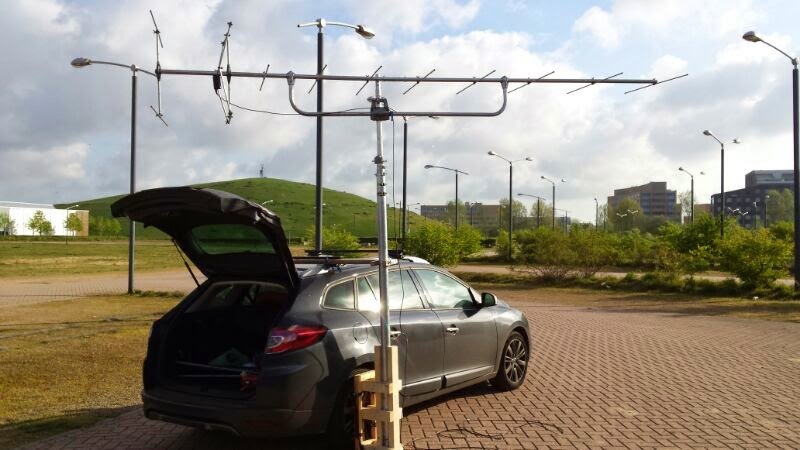 Even if we could do something about the antenna we would have to fight QRM at S9 on 80m and high QRM on 40m as well. This would limit our operations to the higher bands which close in the early evening. After some searching PG8M found a camping ground near to his QTH that is closed at this time of year but agreed to house this crazy party of hams. The camping features two cabins - 1 comfortable one that is usable in the current weather conditions to sleep in and 1 that will be a challenge to keep warm but that is located next to the sports field and the camping owners allow us to set up antennas on the sports field. The camping is in our own province so we will be handing out GD as exchange code. If all goes well we will be using four to five antennas. On my aluminium push up mast we will set up my tried and trusted hexbeam for the higher bands 10-15-20m. 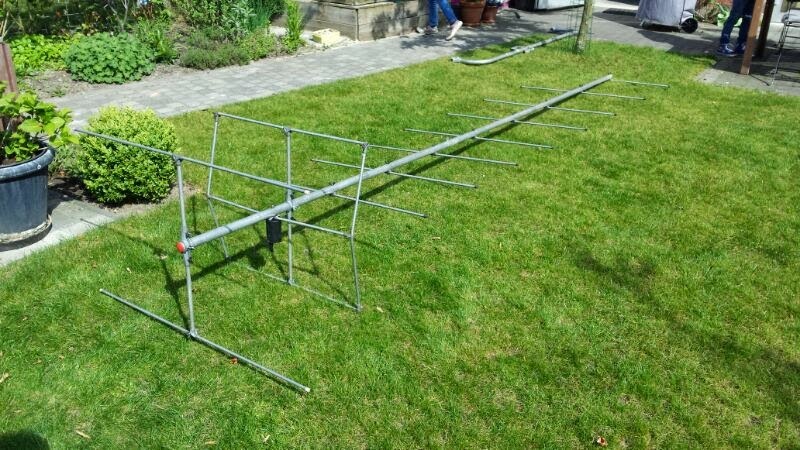 If 10m is busy we might add my 4-el yagi (in a set-up I used during CQWW last fall). For the low bands we will be using a full size inverted V for 40m and one for 80m. They will be on my new 17m long SpiderBeam fibreglass pole. I added this pole to my collection only last week specifically for the 80m inverted V. On my 12m pole the tips of this antenna nearly touch the ground. The last antenna we will install will be a 160m full size end fed constructed by PG8M. This will run horizontally over the sports field on a height of 10-12m. 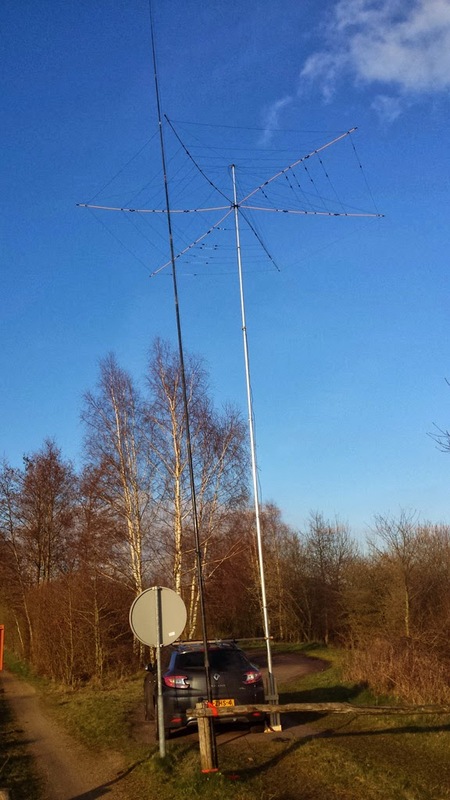 Most probably not a "killer DX antenna", but it might help us to gain a few multipliers. We will hook up the antennas to my IC-756ProIII and run N1MM to log our contacts. The three of us are all phone operators, so we will focus on SSB. In the late afternoon on Saturday we expect to have a couple of CW operators visiting us - so we will do some CW activity as well. Another mode does not give us any extra multipliers but it might give us a couple of new calls to log. I hope we will do well and meet a few friends in the running.